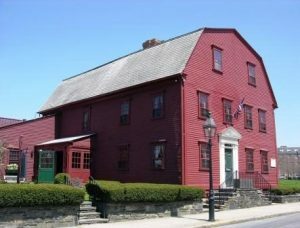 Newport, Rhode Island, where long ago, (although it maybe hard to believe and is rarely mentioned), while piracy was raging in the Caribbean, it was also alive and well in Newport, Rhode Island at the end of the 17th century and into the 18th century. 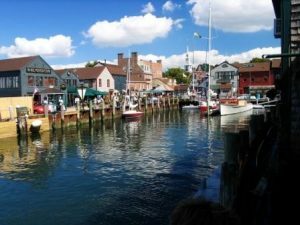 For Newport then, was one of the premier colonial harbor towns, with a large deep water port that allowed ships to sail right up to the docks and unload, a luxury when many locations required anchoring out, with shallow draft skiffs to bring goods ashore. However, a lenient and even encouraging atmosphere was just as much a draw as a deep water active port for those that “bent the rules”, to make Newport not only their home, but also their port for refit work, and overhauls. Goods were easily swallowed into a vast void ashore and pirate captured ships were even re-named and provided new colonial Owners in the courts of Newport. In fact piracy in Newport was so prevalent at the end of the 1690’s, that notice was taken in London and censure was sent. A request was even made in London by English Trade Officials to remove the Charter for the colony of Rhode Island. However, even so, the Navigation Acts passed by England in the early 1690’s only encouraged piracy, and soon Newport was a stomping ground for Blackbeard, Henry Every, William Kidd and Thomas Tew to refit their ships, take on provisions, recruit young enterprising “sailors” from the locals and even take up residence, as Thomas Tew was often referred to as Newporter. Into the early 1700’s, piracy began to impact the local burgeoning honest tradesmens and their Newport shops, as the age old philosophy of looking for the best price, was being found locally in the holds of pirate’s ships nd not on the shelves in the local shops. By 1720, piracy was so frowned upon by the previously welcoming authorities, that 26 pirates were hung outside of Newport, which sent a message far and wide that only legal commerce would be tolerated, at least until the age of rum running and prohibition, which was also an active operation in Newport. Sailing into Newport Harbor, just like the pirates of before, still allows a sail right up to the docks as the deep water nature of this harbor has never changed. 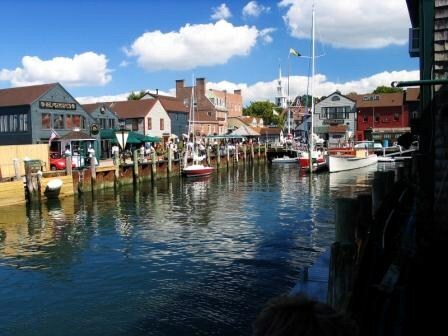 However now, instead of being a pirate, visit Newport on a yacht charter and take the Pirates and Scoundrels Walking Tour in colonial Newport offered usually each summer and find out why Rhode Island, at the end of the 17th century was often referred to as Rogue’s Island instead of Rhode Island.